Location, natural resources. Population. 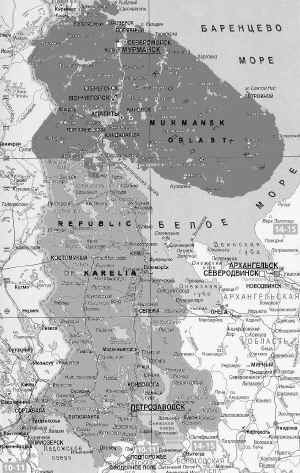 The Republic of Karelia takes intervening position between the basins of the Barents and the Baltic seas. The total territory of Karelia is 172 400 sq.km. In the west Karelia borders on Finland; in the north, on Arkhangelsk Oblast; in the south, on Vologda and Leningrad Oblasts. The most part of the republic's territory (148 000 sq.km. or 85%) is comprised of state forest stock. 25% of the territory is covered by water. There are 27 000 rivers and over 60 000 lakes in Karelia. Lake Ladoga and Lake Onego are the largest lakes in Europe. The total length of the waterway network is almost 83 th. km. Natural resources. 50 useful minerals are found in Karelia, located in more than 400 deposits. Among them are: iron ores; chrome and titanium-magnetite ores; vanadium; molibdenum; gold; quartzites, including crimson quartzites; shungites; gabbro-diabases; granites; marble. Karelia has been identifies as having diamond deposits. At the present time a search is being carried out. Transport.The Republic has a rather well developed network of transport infrastructure. Water communications connect Karelia with the Barents, Baltic, Black and Caspian Seas (through the system of rivers, lakes and canals). Federal railway and automobile highways cross Karelia and connect Murmansk Oblast and Murmansk sea port with St.-Petersburg, Moscow, the center of Russia and with Finland. A modern highway runs along the October railroad and connects Karelia with Leningrad and Murmansk Oblasts. A commercial railroad Ledmozero-Kochkoma, which will link the western border with the October railroad, is under construction. Length of transportation network is: railroads (2.917 km); highways (14.373 km); water-ways (2.1 km); air routes (2.71 km). Density of a hard covered road network - 36 km for every 1000 sq.km. of territory. Administrative -- territorial division. Authority. The republic consists of 19 sovereign territories, 808 populated areas. There are 3 cities of the Republican significance (Petrozavodsk-282.9 th., Kostomuksha- 32.5 th., Sortavala-20.2 th. inhabitants), 4 towns and districts of republican significance (Kem and Kemsky district, Kondopoga and Kondopozhsky district, Pitkyaranta and Pitkyarantsky district, Segezha and Segezhsky district), 11 districts including Kalevalsky national one, 1 volost (Vepska national volost) with the status of administrative and territorial unit, 11 settlements of town type. A sovereign territory of the republic is led by the Head, elected in accordance with the Constitution of the Republic of Karelia through direct secret voting. According to the Constitution of Russia, the Karelian Republic (KR) is a subject of the Russian Federation. The Legislative Assembly is a representative body and the only legislative body of KR, a successor of the Supreme Soviet of the KR. It consists of two houses - the House of Republic and the House of Representatives. The deputies of both houses are elected for 4 years. The Government of the Republic of Karelia consists of the Head of the Government of the Republic of Karelia, the first deputy head and the deputy heads of the Government, leaders of the republic bodies of the executive power. 12 ministries, 8 committees are included in structure of the executive authority of the Republic of Karelia. Economy. GRP in the Republic of Karelia in 1998 - R 11306 mln (USD 546.2 mln), that amounts to 0.5% of GRP for Russian Federation (4.6% of GRP for Northwest of Russia). GRP per capital in the Republic of Karelia in 1998 - R 14601.6 (USD 705.4). Industry. The structure of the economy of the Republic is industrially oriented and is characterized by the prevalence of extractive industries. The leading role in the industry belongs to the forest complex. The role Karelia plays in Russian economy is determined by the branches using local natural resources (timber, wood-processing, pulp and paper industries, ferrous metallurgy, construction materials industry), and also by the well-established branches of machine-building, non-ferrous metallurgy, and other industries working on imported raw materials. The republic makes 9.2% of the total amount of iron are got in RF, 21.5% of total amount of paper produced in RF, 7.3% - of pulp, 7.3% - of industrial wood, 4% of sawlog, about 60% of paper bags. In 1999 - first half of 2000 year industry was being restored and even grew. Index of industry output in 1999 in Karelia accounts for 122.0 % of 1998 level. On the whole stable work characterizes enterprises of pulp and paper industry. In 1999, paper production grew by 27%, pulp - by 87%, paperbags - by 41%, paperboard - by 39%. The second large is metallurgy industry. In 1999 the industry volume rate in ferrous metal industry grew by 3.7% comparing to 1998. In mining industry volume index made 114% in extractive industry , 132% in construction materials production comparing to 1998. 1999 was marked by production volume growth in makingmachinery industry -volume index made 146.1%. Agriculture. Karelian agriculture focuses on milk cattle-breeding, poultry farming, potato- growing, vegetable-growing, and on growing animals for furs. Investment activities. In 1999, for the first time for last years there was a growth of the investments in a fixed capital, which has constituted 153% to 1998 level. Major factor of this growth - improvement of financial status of enterprises. Main size of investments in 1999 concentrated in industry (46.3%) and transport (16.7%). Main share of foreign investments in 1999 concentrated in industry (97.6%). In Karelia there are over 200 functioning enterprises with foreign investment with 41 countries as participants. 22% of the enterprises are fully owned by foreign investors. Most of the enterprises are established by entrepreneurs from Finland (56%), the USA (6.8%) and Germany (4.3%). Main spheres of the economy, where enterprises with foreign investment are established are as follows: logging and timber processing, lumber production, timber goods manufacturing- 23.9% ; wholesale and retail trade, intermediary activity- 21% ; organization of car service, car sale, transportation and passenger services- 8.3% ; geological prospecting, deposit mining- 5.3%; road and housing construction, industrial construction- 5.6%. Free economic zone. The establishment of a free economic zone is planned in the city of Kostomuksha, located in the north of Karelia near the Finnish border. The Conception of the free economic zone has been confirmed as the official conception of the Government of the Republic of Karelia. At present preparation for technical and economic research and feasibility study is carried out. Выступление В.А.Шлямина, Министра внешних связей Республики Карелия на международном форуме "Северное измерение. Социальное благосостояние и здравоохранение". 17 сентября 2002 г. В.А.Шлямин, Министр внешних связей Республики Карелия, председатель Комитета по международной и внешнеэкономической деятельности Ассоциации "Северо-Запад" выступил с докладом «Социальная и экономическая составляющие "Северного измерения" должны быть гармонизированы» на пленарном заседании международного форума "Северное измерение. Социальное благосостояние и здравоохранение" в г. Йоэнсуу. Ознакомиться с текстом выступления можно на официальном сервере органов государственной власти Республики Карелия. В мае 2002 года вышла из печати книга “Природное и культурное наследие островов Белого моря”. Это первый подобного рода совместный труд российских и скандинавских специалистов, где представлены результаты исследований культурных памятников и природы Карельского Беломорья, а также побережья Норвегии и Швеции. Большая часть представленных в книге материалов, касающихся Беломорской Карелии, получена в ходе совместных работ в рамках долгосрочного комплексного международного проекта “Культурное и природное наследие островов Белого моря”, стартовавшего в 2000 г. Участниками проекта с российской стороны были исследователи из Карельского научного центра Российской академии наук, Государственного центра по охране и использованию памятников истории и культуры при Минкультуры Республики Карелия. Западная сторона была представлена в проекте учёными из университетов Тромсё (Норвегия), Уппсала (Швеция), а также сотрудниками ряда шведских и норвежских музеев. В 2002 году к реализации проекта подключаются и финские исследователи (Университет г. Хельсинки). В апреле этого года Республика Карелия в числе немногих регионов из стран Восточной Европы была приглашена к участию в конкурсе "Регион Европы - 2003". Подобные конкурсы для регионов стран Европейского Союза с 2000 года проводит международная организация "Европейский регион года" со штаб-квартирой в Барселоне (Испания). В этом году в конкурсе впервые участвуют и регионы стран, не входящих в ЕС. Несколько дней назад Международное жюри назвало два победителя – это испанский регион Балеарские Острова (от стран ЕС) и российский регион – Республика Карелия. Президент международной организации "Европейский регион года" поздравил Главу республики Карелия Сергея Катанандова. В послании, в частности, говорится: "Просим принять наши сердечные поздравления с успехом. Мы уверены, что с этого момента Республика Карелия получит еще более широкую известность в мире со всеми сопутствующими положительными результатами, которая приносит подобная победа в конкурсе". По вопросам приобретения монографии можно обращаться в Петрозаводский Государственный университет.